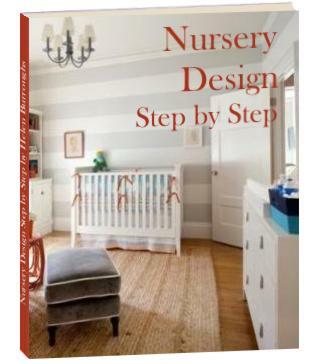 Ideas For Decorating Your Baby Nursery in a Cool and Breezy Beach Nursery Style. Bring back cherished childhood memories of those relaxed summer days filled with fun on the beach. Soft shades of blue and green, coral pinks and natural sand with plenty of white. Small touches of dark blue, sea-green, rocky gray or seaweed brown can be very effective if used sparingly. Light colored, painted or distressed furniture. 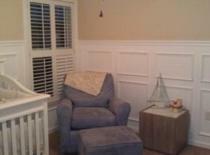 Wicker also works well in this nursery style. Simply painted walls. 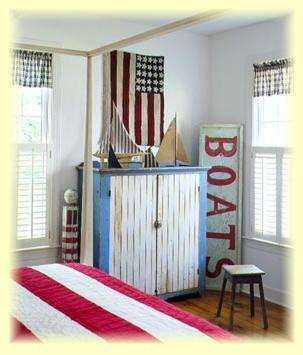 Add horizontal bead board to enhance the beach appeal or paint with pastel stripes to give a deck-chair feel. Laminate or natural wood flooring with textured natural rugs. Try sisal or bamboo. Windows are covered with natural or white slat-wood blinds or roll down shades. Alternatively, light airy curtains are perfect. Use strings of shells or barnacles to tie the curtains back. 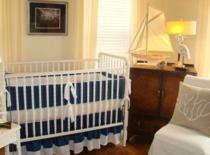 Fabrics include cotton, canvas, fresh linens and beach nursery bedding. Deck chair stripes in light pastel colors add wonderful beach inspiration. Don't forget to add some sea-inspired accessories to your beach nursery design. Stick sea shells around simply whitewashed picture frames. Jazz up your nursery mirror by attaching a blue or coral colored starfish to each corner. Sand down a piece of drift wood and paint your baby's name or initials on it. Fill a plain glass vase with shells, sea-glass or interesting water-worn rocks. You can also use this idea to create a unique baby lamp. Just find a basic lamp wih a hollow glass base and fill it up. You can use shells to decorate the shade too. To make beach inspired nursery wall art, arrange a few shells or starfish on a dark piece of cardstock and frame it in a plain white picture frame. You can wrap colored wine around the outside of the frame to complement the color of the cardstock. Or create a mosaic for the nursery wall using nothing but sea-glass. You can even arrange an assortment of beachy paraphernalia in shadow boxes. The possibilities are endless. Try combining some of the above ideas to create something new. Add sailboats, lighthouses, life saving rings, sea horses. Anything that reminds you of the sea. Just have fun bringing the beach inside. 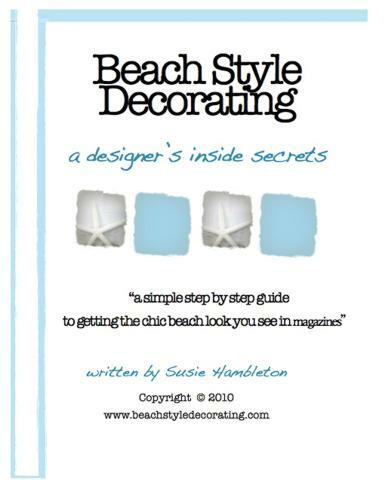 If you love the beach like I do, but you're not sure how to bring the beach decorating style into your home successfully, don't miss this great little e-book. 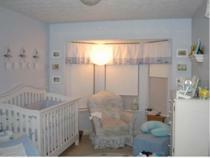 Check out these baby nursery rooms designed around a sea theme for more nursery inspiration and ideas.